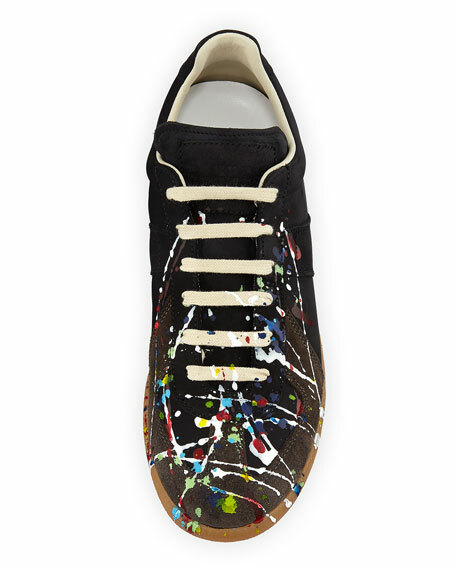 Maison Margiela calf leather sneaker with splatter-print design. Flat heel with slight platform. Enigmatic Belgian designer Maison Margiela is a pioneer of avant-garde fashion, working with other deconstructionist designers during the 1980s to redefine luxury under radical new terms. In conjunction with the influential Antwerp Six and pioneers like Comme des Garcon's Rei Kawakubo, Margiela challenged the boundaries of convention, turning out extreme proportions, deconstructed designs, and conceptual pieces made from found objects like trash bags and seat belts. Though the famously reclusive Margiela is no longer with the label he sold in 2002, his distinctive vision is as relevant as ever, influencing a new generation of mainstream and directional designers alike. adidas by Raf Simons low-top canvas sneaker with rubber trim. Asymmetric tongue with symbols on contrast side. 1" platform. Round capped toe. Lace-up vamp. Logo at side. Suede-heel lining. Padded footbed. Rubber outsole. Imported. EXCLUSIVELY AT NEIMAN MARCUS Giuseppe Zanotti men's low-top sneaker in calf leather with patent leather trim. Round toe. Lace-up front. EXCLUSIVELY AT NEIMAN MARCUS Giuseppe Zanotti men's low-top sneaker in calf leather with patent leather trim. Round toe. Lace-up front. Dual side zips. Metal detail at tongue. Dual side zips. Pull tab at back heel. Rubber outsole. "London" is made in Italy. 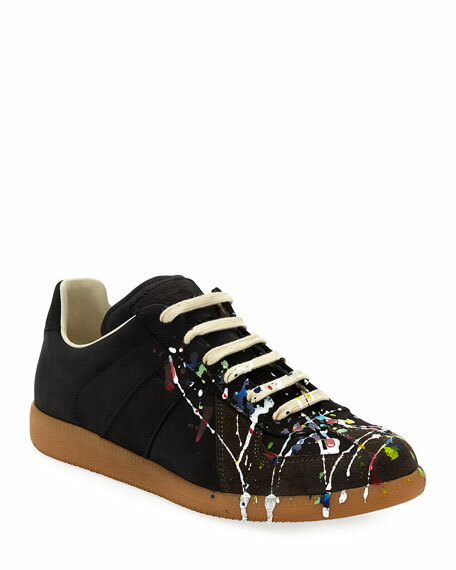 Maison Margiela leather and suede low-top sneakers. Round, reinforced toe. Signature label at tongue. Padded collar. Maison Margiela signature white stitched label detail on back collar. Leather lining and insole. Rubber outsole. Cotton lining. "Replica" is made in Italy. 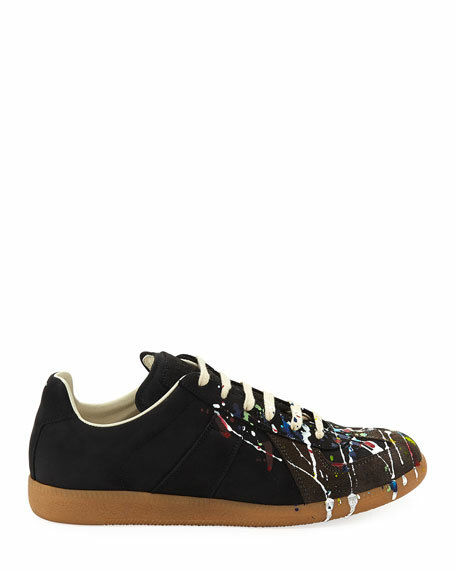 Maison Margiela hologram faux-leather low-top sneakers. Round, reinforced toe. Signature label at tongue. Padded collar. Maison Margiela signature white stitched label detail on back collar. Leather lining and insole. Rubber outsole. Cotton lining. "Replica" is made in Italy.